Elsewhere, the remarkable ascension of the Colorado Eagles continues. The very successful franchise out of Loveland has gone from the defunct CHL to the ECHL and now to the AHL as they become the 31st team in the circuit as the affiliate of the Avalanche. Also departing the ECHL is Quad City, however we’ll still see hockey at the Taxslayer Center as the Storm join the SPHL. Replacing those two departing ECHL teams are a pair with awesome names and logos: the Maine Mariners and the Newfoundland Growlers. Both are welcomed back as professional hockey rightly returns after a brief absence in Portland, ME and St. John’s, NL. Another team worth watching is the Florida Everblades, the reason being to see if Hertz is able to weasel its way into coinciding their arena naming rights agreement with an all-out paint job that would turn the exterior of Estero’s arena to bright yellow. Boo. In the far lower leagues, we say goodbye to the Mississippi RiverKings and a big hello to Elmira, as they and First Arena return as the Enforcers in the FHL. While all is quiet in the College ranks, we do have one new arena in Junior Hockey and it comes from the Q. The teams from the Maritimes have some impressive facilities and you can now count Moncton in that group. The 8,750-seat Avenir Centre is the new home for the Wildcats as their days in the Coliseum end. That former AHL building will focus on hosting trade shows. Junior Hockey in Canada starts in September and what a lovely sightseeing/hockey trip one could make during that time to Saint John, Moncton, Charlottetown, Halifax and Cape Breton. Back in the States, Muskegon did a big renovation at LC Walker Arena, essentially giving it the Minor League Baseball treatment by adding a plethora of social spaces (beer garden, party decks, suites, etc.). While T-Mobile Arena has been open for over 6 months, it made it’s professional tenant debut a few weeks ago as the Vegas Golden Knights dropped the puck after a stirring pre-game ceremony. It is obvious that this arena will feature plenty of road team fans for every game given it’s location in a destination city. The question is will the Knights and their fans be able to make it a rink that is decidedly in favor of the home team? I hope the front office gets creative with keeping tickets in the hands of the gray and gold come playoff time. We also had another arena opening in Detroit as the Red Wings moved into Little Caesars Arena. It looked like a typical Red Wings crowd on opening night, an ominous sign going forward. Beautiful building, but I am going to miss that decrepit, yet nostalgic scoreboard at The Joe that amazingly survived in this time of technology. Finally, news from Ottawa where the team reduced the seating capacity at the Canadian Tire Center in an effort to increase demand for tickets after the team got some flak for not selling out during the playoffs. Maybe the NHL is reaching its limit for exorbitant ticket prices? Down in the minors, there was some shifting as Binghamton moved to Belleville, ON, bringing the Senators a closer affiliate. In the process, the city of Belleville spruced up Yardmen Arena for the AHL. Nice to see a team back in that area after they recently lost their OHL franchise. As for Binghamton, hockey thankfully will still be played in their fun, old-school 70s arena as they get the Devils franchise from Albany. That does mean the Capital District is without a team for the first time since the early 1990s. The franchise struggled to draw for years and the game I attended there way back in 2002 was a dull experience. Times Union Center remains on The List however, thanks to Siena Men’s Basketball, who continue to play home games downtown. One other big change is the new arena completed in Laval, Quebec. The suburb of Montreal will host the baby Habs in the 9,449-seat Bell Place and the team name is the Laval Rocket. 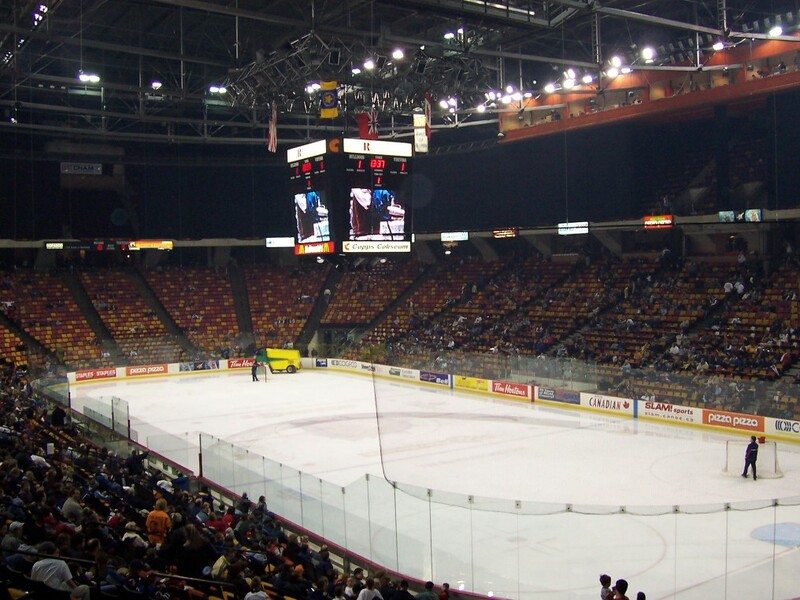 They replace the St. John’s IceCaps and I hate to see Mile One Centre lose hockey. Those great people unfortunately suffer in the hockey world due to their remote location. A National Basketball League – Canada team will at least become the main tenant in that building. In the ECHL: We have to say goodbye to the Alaska Aces and Elmira Pioneers. While Sullivan Arena is still going to be filled by the University of Alaska-Anchorage hockey team, the same can not be said for First Arena in Elmira. That is a rink I have been to a couple times and one that I really enjoyed. 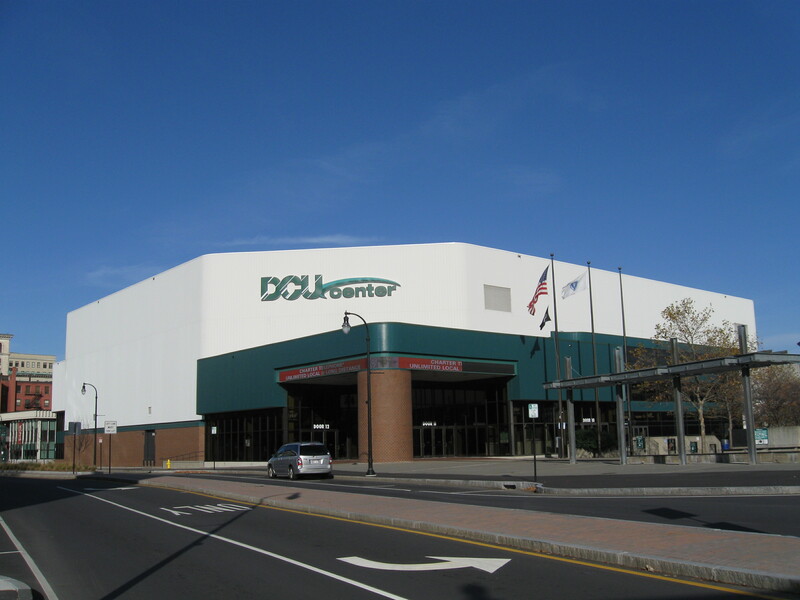 There is good news in a returning arena that I have visited as the city of Worcester is back, along with the DCU Center, just a few years after losing the AHL. Amazingly, the new Railers sold the place out for their season opener and it would be awesome to see that good support continue (like Albany, the AHL didn’t do that great in Worcester). Moving up from the now-defunct CHL is the Kansas City Mavericks. It’s not the Sprint Center, but rather Silverstein Eye Centers Arena in nearby Independence that is the home arena, which is a much better fit. Finally, Jacksonville takes over the former Evansville Icemen franchise, who were supposed to relocate to Owensboro, KY before that deal fell through. The Icemen will play in Jacksonville Veterans Memorial Arena. The SPHL continues to chug along, which is good as we need a “Single-A” hockey league. Sadly, the Columbus Cottonmouths suspended operations and the team will not be back after playing uninterrupted for 21 seasons. We will see the Birmingham area get a franchise, though they won’t be playing downtown, instead they are at the Pelham Civic Center, a tiny little place that seats under 3,000 and doesn’t qualify for The List. Both NCAA Hockey and the three Major Junior leagues in Canada feature no changes this season. There a couple of tweaks in the junior-level United States Hockey League as we saw Bloomington go through a rebrand (now known as Central Illinois Flying Aces). Their arena name changed too as it is called Grossinger Motors Arena. Up in Madison, big changes as the Mad Caps leave Veterans Memorial Coliseum. They were supposed to go to Hartmeyer Arena, but then that arrangement did not work out and they ended up at a 1,300-seat recreation rink. Not good and let’s hope that franchise is not in trouble. I actually had plans to attend a Capitols game at the Coliseum last year and am glad that did not happen as it would’ve been a waste of visit with the team departing shortly thereafter. It should be noted that building does still live on as it is the annual host to Wisconsin’s High School Hockey State Championship. A few months ago, when I was planning a sports trip to Michigan, we had a free evening to potentially find another event to attend. Before ultimately settling on Michigan Volleyball, I looked into attending a USHL game in Plymouth. This was not any old team we would be seeing, instead it would be “Team USA”, a moniker that certainly sticks out in a Standings full of Midwestern city names. I’ve always been curious what this Team USA was all about whenever I stumbled across the league, but never took the time to dive in until now. The whole idea and concept of this team seemed sketchy to me and further reading does not change my mind. 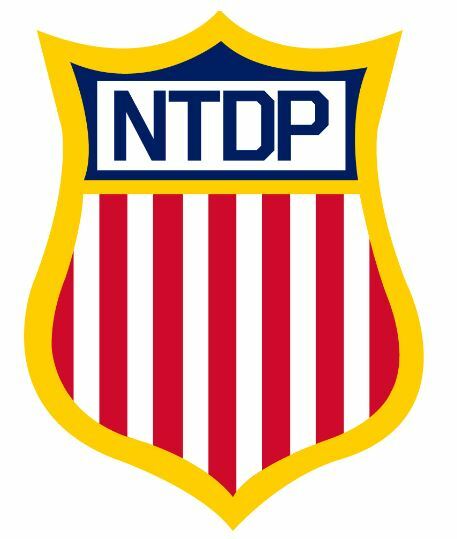 The NTDP part of Team USA stands for National Team Development Program. USA Hockey essentially scouts and recruits what they feel are the best teenage hockey players in the country. Those that join go to school with them where they learn off the ice and on it, in efforts to groom them for the world stage. US Hockey has an Under-17 team and an Under-18 team, both of which play exhibitions against NCAA teams and National Teams, along with playing against competition in the USHL. 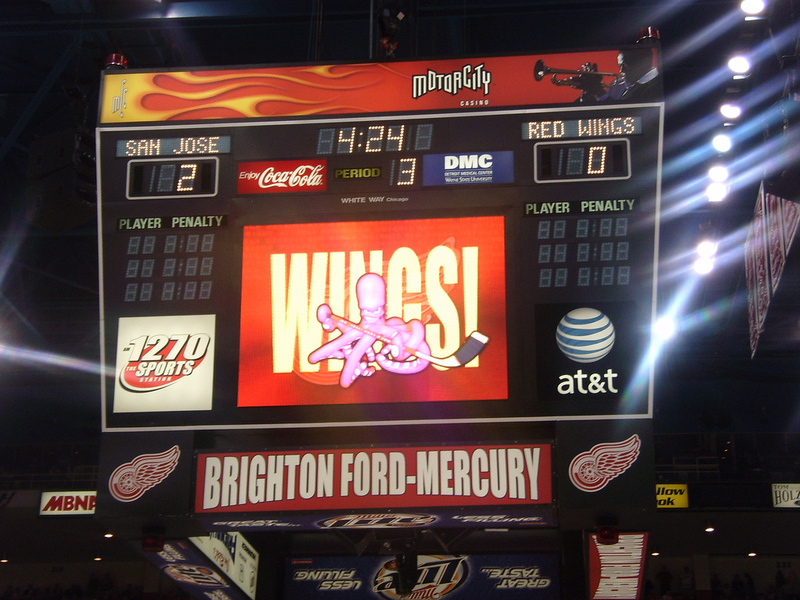 After initially having a home base in Ann Arbor for years, the program recently took over the former home of the OHL’s Plymouth Whalers and the 3,500-seat Compuware Arena is now known as USA Hockey Arena. The USHL is a junior league, with similar teams made up of young amateurs. Despite a mix of U17 and U18 teams playing, their results make up a schedule that puts them under one “Team USA” squad. The whole thing feels wrong already because you would think this is an all-star team. While that may be the case, they certainly don’t play like one as Team USA has never won a league title and has not had a winning record in the last six seasons. That brings up another concern…if the team is not winning, is US Hockey successful in their program?. A follow-up is how much money does US Hockey put into the program? These are questions that I can’t answer, but thankfully someone has asked them. For more interest, I encourage you to check out Kevin Hartzell at Letsplayhockey.com as he thoughtfully broke down the US NTDP situation and asked questions of the program. There are three articles on the subject (towards the bottom) and if you are interested, they are well worth the read as Kevin did a great job. My initial feeling of not liking a Team USA in the USHL has not changed after digging deeper and reading Kevin’s insight and questions on the program. With all of the major hockey leagues having started their season, it’s that time of year where we take a look at what’s different in the arena world. 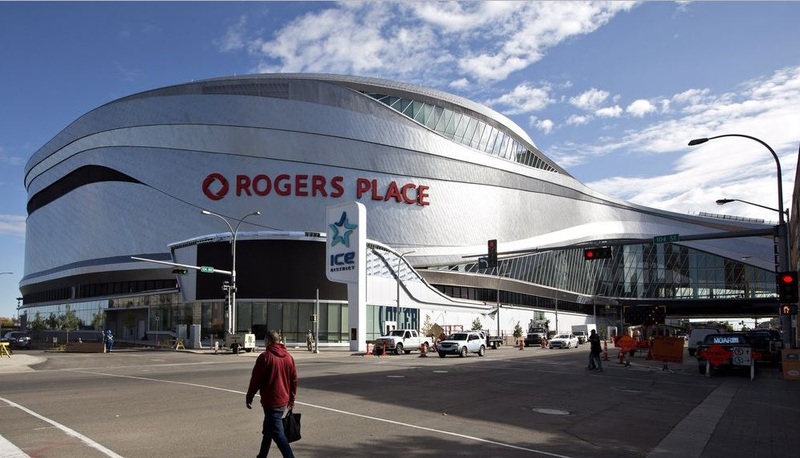 The most significant update comes from Oil Country, where Edmonton opens Rogers Place after saying goodbye to their home in Northlands earlier this year. It certainly is a big difference in arenas and aside from typical opening-night issues, it seems fans really like the place. Of course, the building didn’t come without funding controversy and the downtown location has a few issues like lack of parking. But bringing people into the city as part of a huge development looks like a mostly big positive. The true test I care about will be the playoff atmosphere as the old Northlands Coliseum was deafening (forward to 6:28) and I hope (but doubt) the new joint comes close. For a great recap of the entire process for Edmonton getting a downtown arena, check out this recap from the Edmonton Journal. In other NHL news, Buffalo has a new arena name for the umpteenth time. Maybe they should consider avoiding naming rights deals with banks? Also, Pittsburgh’s arena has been changed after just a few years as we now are supposed to call it PPG Paints Arena. In the AHL, the march westward continues as NHL teams push to be closer to their affiliate, even at the expense of balanced competition. The Springfield franchise was sold to Tucson and while this may seem ridiculous from a fan support aspect, keep in mind that Springfield had horrible attendance in recent years. The Roadrunners (love that nickname) will be playing in a renovated Tucson Arena as we welcome that facility to The List for the first time. The arena is located within a larger convention center complex and it will seat 7,440. As for Springfield, one of the AHL’s oldest locations and the home to league offices, they will indeed have a team as the Portland franchise relocates to Western Mass. Hard to imagine the AHL without Maine, but that will be the case this season. In what should be a lesson to idiot city/state governments: they just spent nearly $30 million on renovations to Cross Insurance Arena and now, their primary tenant is gone with 25-35 open dates now on the calendar. Portland is trying to get an ECHL team for next season, but that has not happened yet. Elsewhere, the Calder Cup Champions changed their name as the Monsters are now Cleveland and not Lake Erie. Good Move. Down in the lower leagues, the Evansville IceMen are in limbo as their potential move to a renovated Sportscenter in Owensboro, KY did not work out. The Ford Center will still have hockey, but it will be in the SPHL as the Thunderbirds begin play in Evansville. That leaves 27 teams in the ECHL, with Worcester coming next season (and the small chance for Portland). The league still has some work to do in order for it to be truly AA with an affiliate to each NHL squad. Back to the SPHL, also joining with a very 1990s nickname is the Roanoke Rail Yard Dawgs. It’s been awhile since we’ve had Roanoke’s arena (Berglund Center) on The List, but we welcome it back with open arms as the city has another stint with professional hockey. Folding from league is the Louisiana IceGators. We do have a couple of arenas to say goodbye to and the first has seen their fair share of minor league hockey teams through the years. Dayton’s Hara Arena has closed its doors after several decades and that forces the Demolition of the FHL to fold. Hara was unique in that it was privately owned and an apparent estate dispute led to the arena’s closure. Also, sad to see Vancouver’s Pacific Coliseum no longer have a sports tenant. After the Canucks moved to Rogers Arena in 1995, the Coliseum remained active and the WHL’s Giants began play there in 2001. It remained home of junior hockey for 15 years until this season when the Giants moved out to the suburbs for play in the Langley Events Center. The move makes sense with a modern facility that fits the WHL much better, still it is sad not to see the old Pacific Coliseum in use. Whenever I hear that name, I immediately think of Pavel Bure and that gold, flying skate logo. Not all is sad however, as there is a very old friend we say hello to once again. In Shreveport, historic Hirsch Coliseum has received a facelift. The work done was enough to get the arena in working order again to get the Mudbugs back and they are indeed playing hockey in ArkLaTex again, this time as part of the NAHL. When it comes to the National Anthem, I have always had a soft spot for the performance that Whitney Houston gave at Super Bowl XXV in 1991. No matter how many times I see it, it works to get me emotional. In the world of sports, hockey probably has the most passionate anthem singers and while watching the playoffs each year, I’m always happy to see NBC show various performances. Though I haven’t heard everybody in the league, there’s a good chance I’ve seen the most consistent performers. Below are some of my favorites. Not on the list: the ridiculous Rene Rancourt of the Boston Bruins. He gets so much play for his gold-tinged outfits and post-anthem fist pumps, but I find him to be completely overrated. Not one of the bigger or most known names on this list, but she can bring it. Always sings a wonderful rendition of the Anthem and doesn’t get cute with it or change any of the notes like so many annoyingly do. Powerful voice. Part of the most unique anthem in sports, Blackhawk fans stand and cheer during the Anthem, so it wouldn’t feel right hearing that operatic voice of Cornelison without the roar of the crowd in the background. He has a commanding presence and that trademark, emphatic gesture during “flag was still there” is goosebump-inducing. Not just a homer pick. Doug has such a nice, clean rendition of the Anthem and he fits the part too, always looking sharp in his tux. I like the couple minor tweaks in his voice he makes during the last few lines and his signature point at the end during ” home of the brave” is great. Another unique tradition come playoff-time is the duet of Lauren Hart and Kate Smith singing not the Star-Spangled Banner, but God Bless America. Lauren starts it out and then when Kate comes up on the scoreboard belting out “From the mountain”, the crowd goes wild. They both come together at the end of the song to finish as a duet thanks to the wonders of technology and Lauren’s remarkable synchronization. I may be an American, but I know all the words to O Canada as well. Such an awesome anthem with a country that takes great pride in it. There are several great anthem singers in the Great White North, but Mark Donnelly is one of the best. Lyndon Slewidge – Ottawa Senators…An operatic voice in Canada’s capital dressed in full garb. Wawaweewa, where do we begin? Lots to discuss, but we’ll start at the top where the only NHL change is with the New York Islanders. 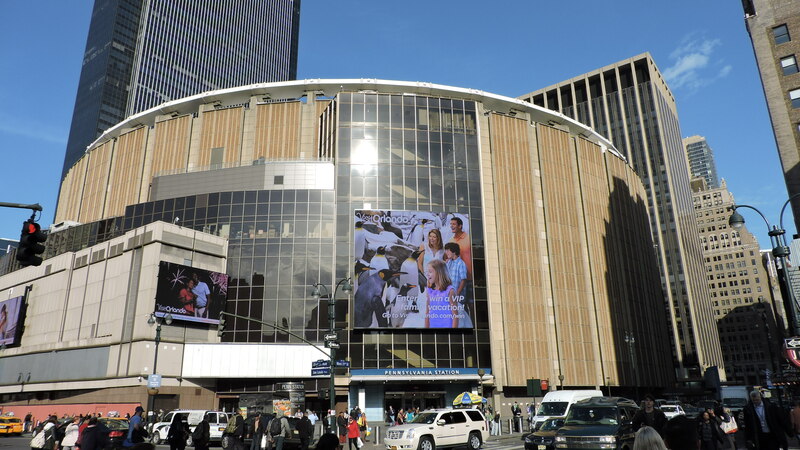 They sadly leave the raucous Coliseum for the non-hockey fitting Barclays Center in Brooklyn. I’ve written about this before and have nothing more to add. OK, now on to the real craziness. The AHL has resorted to extreme measures to appease their big affiliate brothers by creating a West Coast Division this season. The geographical anomaly means that the California teams only play 68 games, while the rest of the league plays 76. Out of those 68, almost all of them are within the division (Bakersfield for example has just four games against teams not based in California, Texas or Manitoba). There’s a couple reasons I hate this and it starts with the continued push in the stressing of “Development”. Unfortunately the days of putting the minor-league city, sweater and fans first are becoming a distant memory. That small-time charm and passion is getting further buried. Secondly (remember I am all about the smaller cities/arenas), there is a disturbing trend of NHL teams putting their farm team in their own building. This is going to happen in both San Jose and Winnipeg this year. Ugh. I’m sure playing in front of hundreds in an empty pro arena will do wonders come playoff time to gain atmosphere experience. Here are the changes (not necessarily the direct relations)…Adirondack, Manchester and Norfolk all drop to the ECHL while Stockton, Ontario and San Diego come up to the AHL. The Oklahoma City franchise folds, while Bakersfield gets promoted up to the American League. OKC’s arena, the Cox Convention Center, remains on The List as it is home for the Blue of the NBDL. As mentioned earlier, San Jose takes their affiliate team in house, while Worcester is left with nothing and there will be no hockey this winter at the DCU Center. The Manitoba Moose are back in the league, while longtime mainstay, Hamilton, oddly drops down to the OHL. The only good piece of arena news this year in the AHL is the return of the Charlotte Checkers to Bojangles’ Coliseum. The team leaves the city’s new pro arena for a return to this 1956 arena that is finishing a big renovation. Yea for that. In the ECHL, Gwinnett changed their name to Atlanta as I guess the branding bigwigs think that is better. Their arena in Duluth has also been renamed “Infinite Energy Center”. With all the big changes at AAA and AA, the A-level SPHL only sees one change and it is the addition of the Macon Mayhem. The city’s Coliseum has been off again/on again for minor-league teams and it will be back on again this winter. Finally, in the very low-level Federal League…Berkshire and Watertown are out, while Berlin, Brewster and Port Huron are in. Both Berlin and Brewster will be playing at community rec-style rinks, while McMorran Place, site of plenty former Port Huron teams, returns. In the OHL, I mentioned Hamilton joining the league and they replace Belleville. 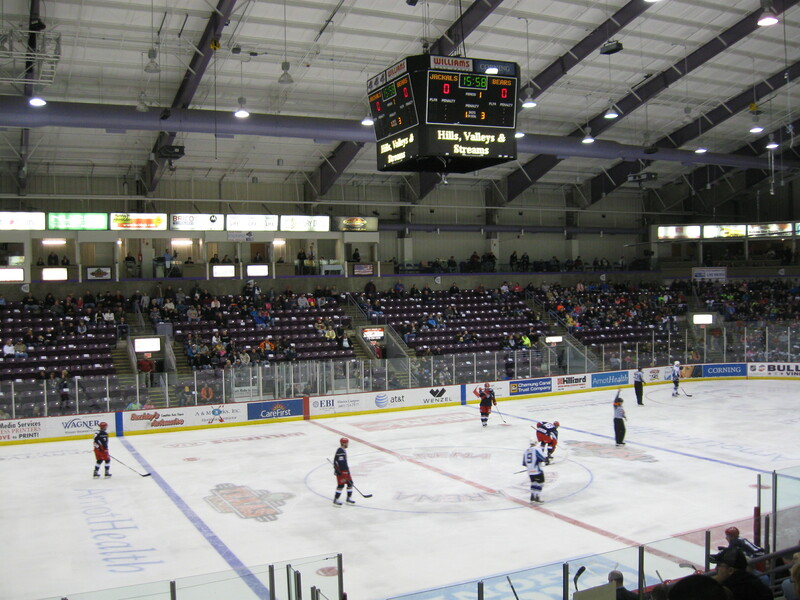 This is a sad move as we lose an old-school OHL town/rink, while gaining a franchise that is much more suited for high-level professional hockey with their games being played in 17,500-seat FirstOntario Centre. The other change is somewhat odd as the Plymouth franchise moves only an hour North up to Flint. Low attendance led to the selling of the franchise, who oh by the way was done by Peter Karmanos, the old jerkoff who moved Hartford to Carolina. Anyway, the move was at least justified here by low attendance, but the weird thing is that the new owners are taking up residence in a city with profound struggles and in an arena that is older. Though Flint’s renamed facility is completing some upgrades to the guts of the building, it’s still questionable to see how successful the move is. By the name, the new arena name is Dort Federal Credit Union Event Center. As for the arena in Plymouth, it was sold to US Hockey, who actually will be placing their U-18 team in USHL there. Out in the Q, we have Quebec City’s Videotron Centre opening to much fanfare and interest. While the Remparts welcomed a sellout for their home opener, this is the building that Les Quebecois are hoping brings the NHL back to the city. Populous built this arena for a cool $370 million and it is designed with very steeply for better sightlines. The design philosophy calls for minimal distractions and complete focus on the game, which I’m liking the concept. The new arena does mean we say goodbye to the Pepsi Coliseum, the old home for the Nordiques and Remparts that was built in 1949. It will lie dormant and the future is bleak for this terrific old place. Another new arena just opened in the WHL as well as Medicine Hat said goodbye to their plain 1970 arena and hello to the Canalta Centre, a building 10 years in the making. The capacity for Tigers’ games is 6,016 and it is a surprisingly large place for a small town that only has a population of 60,000. Lastly, let’s talk College Hockey. If you were to take a guess as to which Division I program would add hockey to their sports profile, I’m thinking that Arizona State would not be one of your first 50 (or 100) that you guess. As crazy as it sounds, the Sun Devils will be an independent this year. While their club team has been very successful and the sport is growing at all levels in Arizona, there certainly are skeptics on the rapid move from rumor to reality. ASU will play home games in the 750-seat Oceanside Ice Arena while waiting for plans to play in a better facility. They will also have some games at Gila River Arena in Glendale. The final new arena this season comes from Omaha, where UNO completes the snazzy Baxter Arena. The facility will not only be home to hockey, but it will also host Maverick Basketball and Volleyball as the school quickly climbs the ladder into Division I for all sports.